Last year, the Sentinel-2A satellite captured an intense algal bloom very close to the Belgian coast. The high-resolution capabilities of Sentinel-2’s main instrument are allowing scientists to monitor algae blooms in areas previously not possible to observe with satellites. 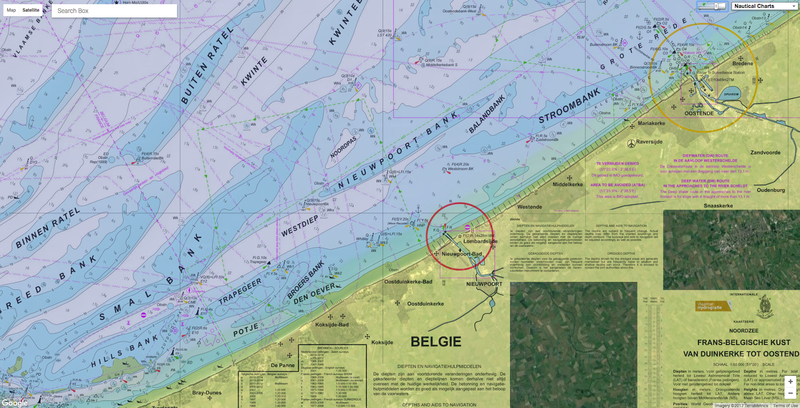 Like many European countries, Belgium regularly reports on the quality of its coastal waters to the European Commission. Water quality measurements have been made from ships for this purpose since the 1980s and, for over a decade, satellite data from Envisat and from Sentinel-3A have been used to supplement ship-based measurements. While these satellite data have been vital for water quality monitoring, they do not provide the adequate coverage nor resolution for monitoring close to the coast. Chlorophyll concentrationOn 1 May 2016, the Sentinel-2A satellite captured an algal bloom close to Belgium’s coast. Thanks to the multispectral capabilities of Sentinel-2’s main instrument, chlorophyll a absorption and hence concentration can be derived, revealing an intense phytoplankton near the Port of Ostend. The Sentinel-2 mission, however, carries a high-resolution multispectral instrument that has great advantages for monitoring near-shore waters. With this finer resolution data now available, scientists can properly analyse the water within 2 km of the coast. In May 2016, scientists discovered an intense algal bloom in a previously ‘unseen’ zone. Owing to the bloom’s extent and the shallow water depth, it would have been nearly impossible to detect or sample using shipborne measurements. “This satellite image was a surprise to me!” said Kevin Ruddick, scientist at the Royal Belgian Institute for Natural Sciences. Algae blooms are a normal phenomenon, providing food for marine organisms. But sometimes they can be harmful to humans and animals when they produce toxic substances, or occur too often or last too long, depleting the concentration of oxygen in the water. On 1 May 2016, the Sentinel-2A satellite captured an algal bloom close to Belgium’s coast. The multispectral capabilities of Sentinel-2’s main instrument allow for an estimate of water turbidity. In this example from May 2016, the algal species is almost certainly phaeocystis globosa, which is not toxic and does not noticeably deplete oxygen in Belgian waters because these waters are highly turbulent and quickly draw down oxygen from the atmosphere. Instead, it creates foam on the beaches which is a nuisance for beach-goers as well as fishermen as it makes their nets sticky and difficult to manage. Nonetheless, it is important to monitor blooms so that fishermen, fish farmers and public health officials know about such events as soon as possible – even more so when the species may be toxic. With its 13 spectral channels, the Copernicus Sentinel-2 mission’s novel imager can capture water quality parameters including algal blooms, as well as surface concentration of chlorophyll and turbidity (or water clarity) – giving a clear indication of the state of the near-shore environment. This information is particularly important for meeting the monitoring requirements of the European Commission’s Water Framework and Marine Strategy Framework Directives. The Royal Belgian Institute for Natural Sciences is funded by the European Commission's FP7 Research Programme HIGHROC Project to develop and test methods to use Sentinel-2 data for this purpose.